If you have a brilliant business idea that requires creating a mobile or web application, there is no need to spend a pile of time and money on development of completed product right from the beginning. 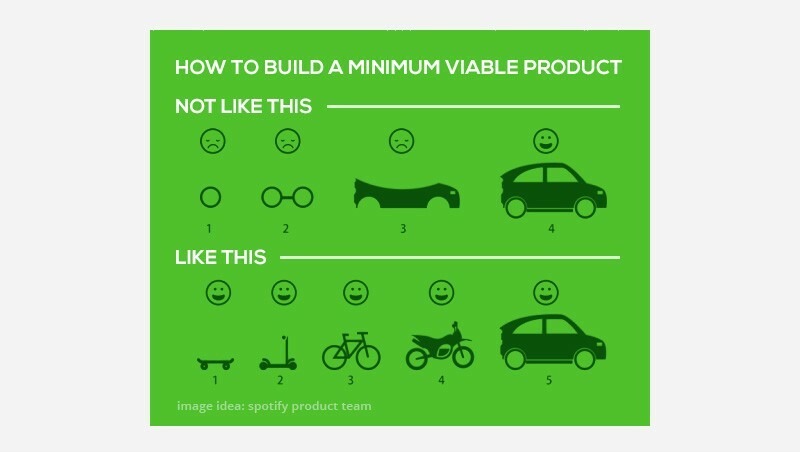 Build a Minimum Viable Product (MVP) and test your idea on viability and feasibility in order to see which further direction to take. This sustainable and widely used approach tempts with all its indisputable advantages, but… again and again startups stumble over it and make mistakes that throw sand in the wheels of their business. What are those mistakes? If only hot-spirited entrepreneurs could take this golden rule to heart! In fact, the idea of MVP is to provide customers with general understanding of the future product, without implementing all possible and sophisticated features. If the product is valuable, reaction will not be slow in coming. You will understand you are moving in right direction even if you implemented only a few features – the main thing is that you implemented the right ones. If the product is unneeded, it will not be saved by extra-cool design and performance. Don’t try to cover all features and OS platforms all at once. Concentrate on iOS and test a few core features before implementing the same for Android. By creating perfect and complex MVP, that covers everything, you slather precious resources and time, which you will need later. It may sound contradictory to the previous statement, but do not economize on essential things. Let us take hosting, for instance. Making a hurry-scurry website at free hosting may cost you more than you think. It is better to have a simple, but reliable and customized web page for presentation of your minimum viable product. Thus, hastily fudged MVP is not right too. “Minimum” in MVP acronym does not mean “not quality enough” or “underdone”. While implying minimum investment risks, MVP should give a rough idea about your product. If the web platform you have just created looks perfectly great, but it is so buggy that the customers may use nothing of it but home page – what’s the use of it? Customers do not sit and wait when you gladden them with a car. Throughout the whole period of product introduction, they are enjoying “lite versions” of the vehicle, each of which is fully functional in its category. Make the final product be the sum of your previous successful MVP introductions, and you will achieve your goal. This rule is also illustrated by so-called Cupcake Model. In it, the first MVP is represented by a simple cupcake, then you start producing full-fledged cake, and finally you offer the market with a large, bright-colored multilayer wedding cake. Even if you started with a cupcake, it was already tasty and cutely packed. Ignoring this model means getting lost in the jungle of finding the right niche. Listen attentively to any feedback you receive from users and testers. All in all, you are creating your product for people, for live users, and their attitude to the things you are doing is a primary thing. If they give you signs that everything is going smoothly – do not hassle and try to bring your product to perfection. When testers signal you that something is over- or underdone – don’t ignore it as well. If you promise that this particular feature would be on your website, or you are going to render this kind of innovative service – come to your customer’s expectations. They may choose you for some feature that is unobvious for you from the first sight. However, everything matters. Don’t lie to people in any cases – be it marketing or any other direction. Community is sensitive to lies, and will not pardon you. If you lied or disappointed your customer, have the courage to issue the public apology for it. This will help you saving your reputation, and consequently, your product. Fair business is always the best one. Do not get too obsessed with brilliance of your business idea – it may hinder you from reasonably assessing how things are really going. We understand that your MVP is your dear brainchild, but it is not an idol you should blindly praying to. If tests show that some element should be dropped, don’t resist only because it seemed valuable for you. Save this idea for later and maybe you will find a better use for it. This is the mistake startups make surprisingly often. Having learnt the principles of lean startup, a few entrepreneurs resist temptation of starting building their MVP right away. Not every business idea is purely innovative and disruptive. A multitude of them replicates many competitor’s features. In such cases, instead of building a minimum viable product, it is better to validate the business feasibility and focus on improvement of user experience in this sphere. Knowing all this, it would be easier to insure your business from having issues. Always remember that while concentrating on the wrong problem may lead to creation of trifling problem, it may be corrected in progress. Solving nonexistent problem, giving people the unneeded product is the dead end. If you overlooked this before engaging into creation of your MVP, you would need a serious reconsideration before you go further. Luckily, there are no unresolvable matters, if you believe so. Listen to your developers, testers, customers and people in the industry who are going the similar way. Be attentive and flexible throughout the whole process of MVP development, and you will be able to avoid these mistakes.